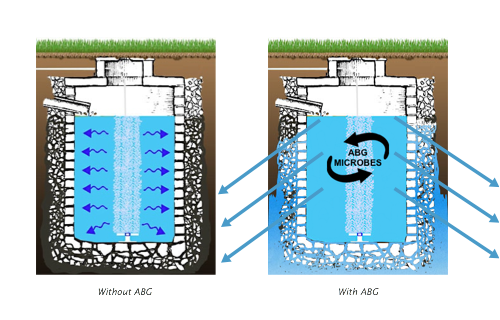 After installing the ABG into a seepage pit, and or single/two compartment septic tank, the ABG blend of powerful biological agents immediately begin processing wastes (including nitrates) within the tank and continue its work throughout the leach field system. 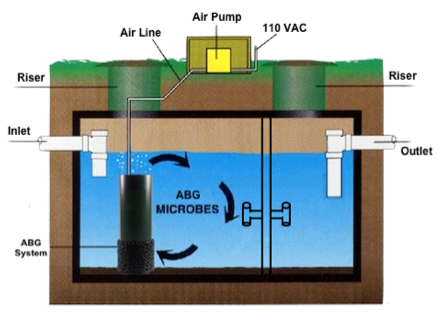 The ABG aerates, circulates, and inoculates the entire contents of a septic chamber at the rate of over 25,000 gallons a day. Within the ABG, circulating septic tank liquids pass over 150 square feet of surface area in which a dense colony of ABG blend bacteria attach and thrive. As the septic liquid passes over the bacteria, organic wastes are rapidly digested. In single volume tanks, cesspools and inlet chambers of septic tanks, this digestion is so complete that regular pumping is no longer necessary. Bacteria in the ABG blend are so aggressive they starve out the resident slime-producing, anaerobic bacteria that produce "biomat" clogging. Leach fields are quickly opened up, further increasing the efficiency of the entire system. The EPA estimates that 95% of septic system failures (over 1 million per year) are caused by "biomat" clogging, which simply cannot reoccur where the ABG is in operation. The nitrification phase of treated effluent is virtually eliminated, resulting in direct denitrification. We offer a free bid proposal and/or design consultation for your septic tank restoration service needs. Please also feel free to browse any of our other websites exploring the various divisions of Prieto Engineering and look into some of the services we can provide for you. Thank you for the opportunity to earn your business.